Nothing announces spring like daffodils popping up through scraggly grass. And once that happens, there’s no stopping the day-dreaming after the real thing, even if tree limbs are still bare. 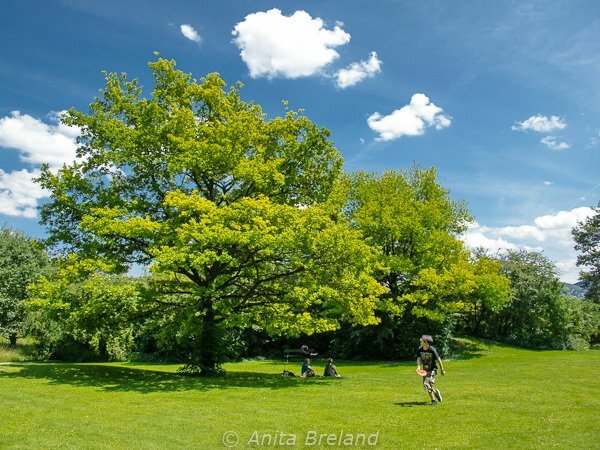 Day dreams being what they are, here’s a preview of one of my favorite places in Basel to pass a spring or summer afternoon: the parkland surrounding the Villa Merian in Brüglingen, slightly out of Basel’s city center. The hilly acreage is surrounded by industrial Dreispitz and the sports complex at St. Jacob, and easily accessible via public transport. The Merian Gärten (Merian Gardens) offer a different view of historical Basel. In 1824, Villa Merian, a Baroque manor house above the watermill and canal in Brüglingen was given to Christoph Merian as a wedding present by his father. 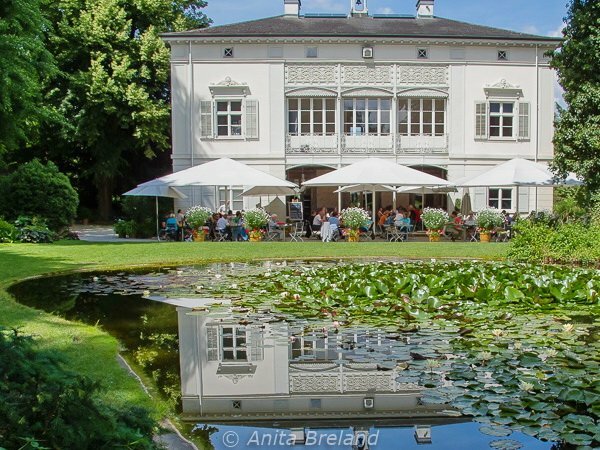 The villa was used as a summer residence by the younger Merian and his wife Margaretha Merian-Burchkhardt until her death in 1886. The generosity of these 19th-century philanthropists continues to benefit the city through the good works of the Christoph Merian Stiftung (Foundation) and affiliates, such as the Christoph Merian Verlag (publishing house). At the end of the 1850s, Christoph Merian commissioned Basel architect Johann Jakob Stehlin-Burchkardt to refurbish the villa in Second Empire style. Merian died in 1858, before the work was completed, but his widow continued to use the villa. Upon her death, her husband’s will became legally binding and the Christoph Merian Stiftung was established. In 1968 the Foundation gave the villa with its gardens to the City of Basel for a period of 100 years, and today, we are all beneficiaries. In 2012, several entities were merged to form the Merian Gärten. The manor at Brüglingen, along with five affiliated farmyards (Singerhof, St. Jakob, Ziegelhütte, Unter- und Vorder-Brüglingen) were owned by the Christoph Merian Foundation. 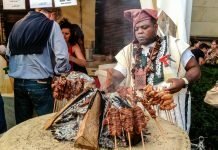 The Merian Gardens comprise numerous gardens, sculptures, an exhibition centre, a restaurant, museums, a playground, a river and a farm. The garden also runs into the leisure complex, Park im Grünen. 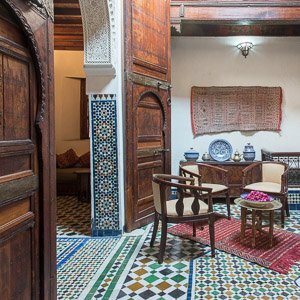 The property includes a 15th century mill, as well as other buildings from the 16th and 19th centuries. 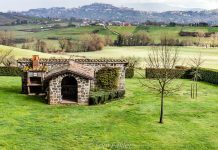 This green oasis covers an area of ​​more than 135,000 m2, and its historic Orangerie is surrounded by a research and school garden covering an area of 1,556 m2. An orchard in the southern part of the park features several hundred plants and many different regional varieties of fruit. A platoon of landscape gardeners keep the gardens in pristine condition. The impressive iris garden is said to be the largest such planting in Europe. It’s certainly popular! 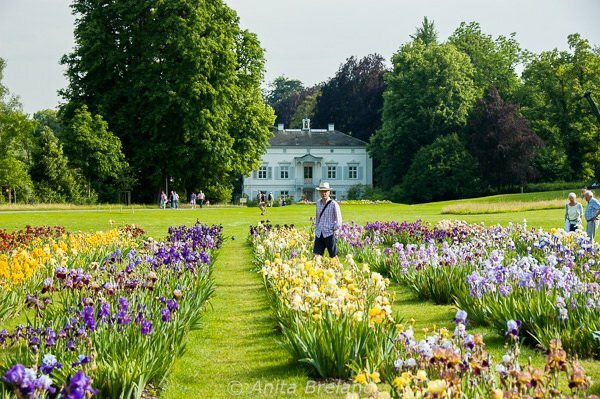 The irises of the Merian Gardens are an ever-popular summer attraction of the Merian Gardens at Brügligen. 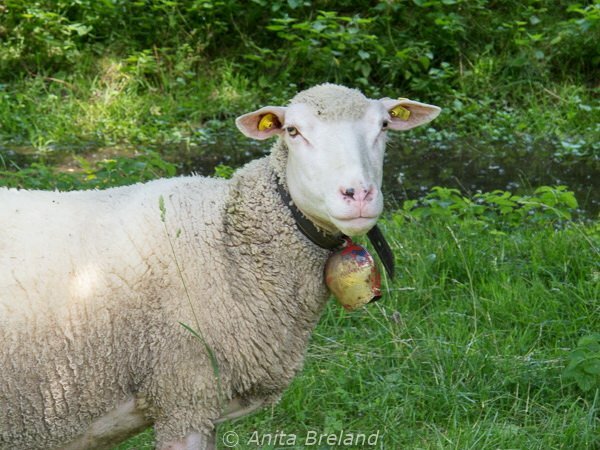 Several protected species, including the Grisons country sheep, live in the Merian Gardens. The landscapes of Merian Gärten are varied: expansive lawns; trellised clematis plantings; and tidy farm plots. 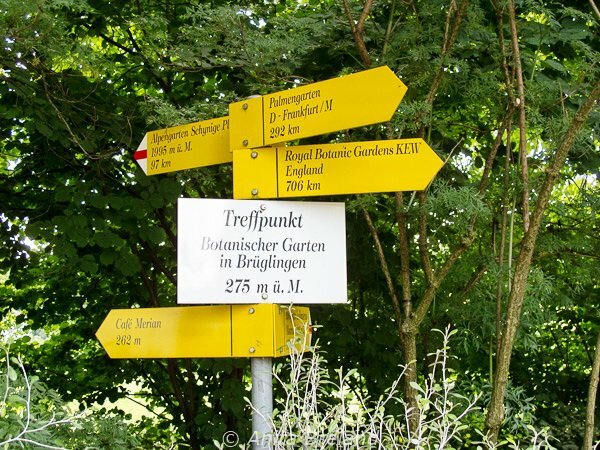 Adjacent to Brüglingerhof, there is even a physic garden, sister to the University Botanical Garden’s plantings for the teaching of botany and ecology. Created in 1711, the physic garden at Brüglingen became part of the estate of Christoph Merian in the 1850s. Today, the garden underpins studies in pharmacy, aromatherapy and naturopathy. 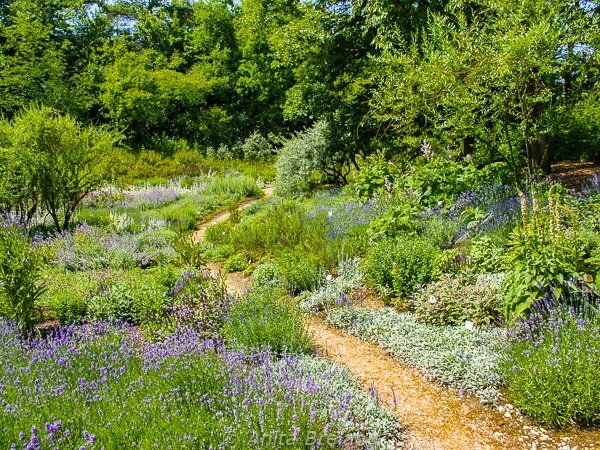 In summer, the Mediterranean garden offer an inviting meander through lavender, thyme and other fragrant plants. Café Merian offers light fare with Mediterranean flair. The terrace behind the Villa Merian has with a view over enormous copper beeches in the Historischer Park, with its lily pond and koy carp. 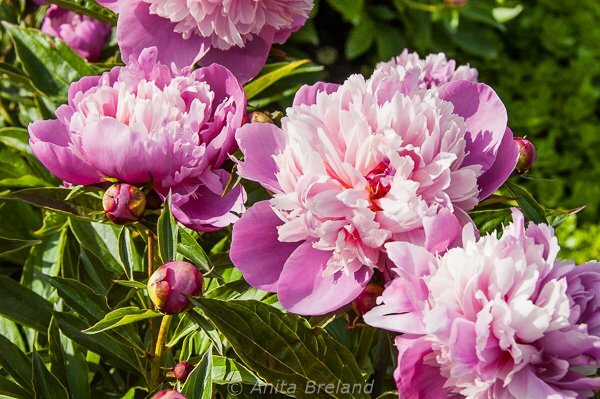 My favorite time to visit the Merian Gardens is when the peonies (Pfingstrosen) are in bloom. The grounds are expansive, but there are lots of benches around the park, handy for a rest break. Trail markers at Merian Gardens point the way to other botanical hotspots, as well as lunch. 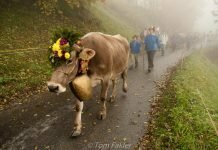 This is a Swiss garden, after all! The Merian Gardens are as much about enjoyable parkland as botanical gardens for research and academic study. 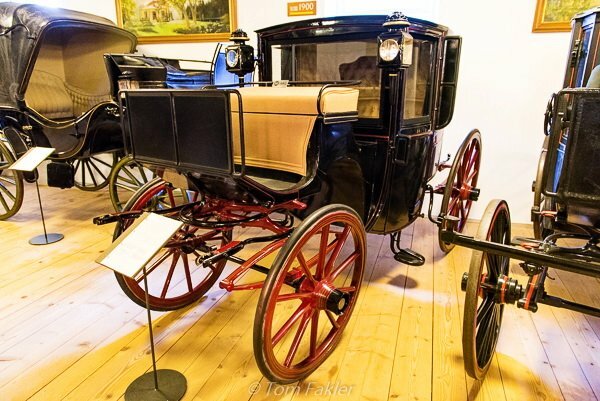 The Museum für Pferdestärken (“Museum of Horsepower”) — one of four locations of Basel’s Historical Museum–has a permanent collection of 19th century carriages owned by prominent Basel families, many of them made in Basel. The museum also offers living history performances in spring and summer. A coupé belonging to Fritz Hoffmann-La Roche, founder of the pharmaceutical company Hoffmann-La Roche AG. It was made by Carrosserie Kauffmann, Reinbolt & Christé Successeurs of Basel. 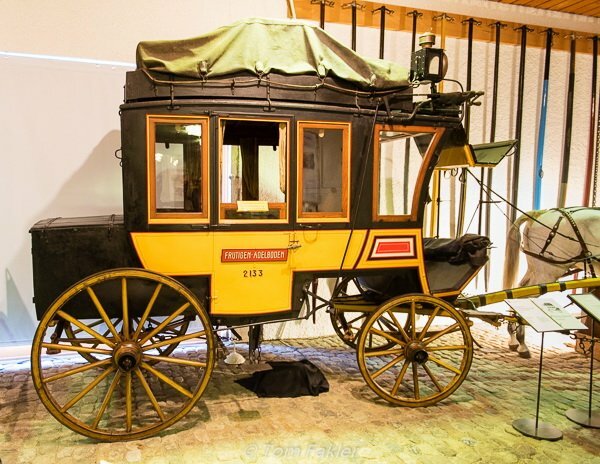 Swiss postal coaches have been carrying passengers as well as mail for a very long time. Can you imagine crossing the Alps in this? 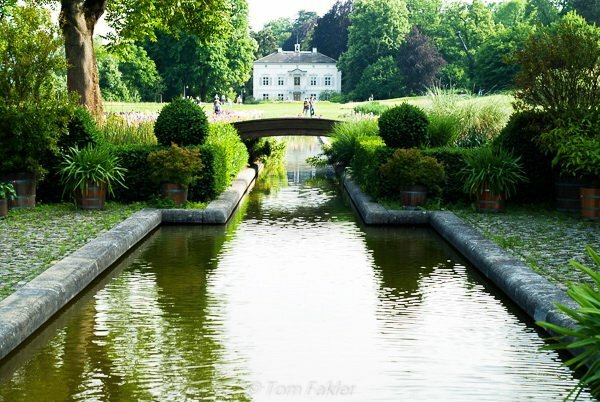 The Merian Gardens are located just a few blocks from St. Jakobs Park, and easily reachable by tram or bus. Check the website (German only) for access information, and to see what is blooming. Be prepared for a walk: there are many trails along several levels as well. Much, but not all, of the grounds is wheel-chair accessible. Find the rhododendrons, and you can access the nature park Park im Grünen, with its children’s playground, dinosaur statue and cycling path. Café Merian is open from 9:00 am until sundown. 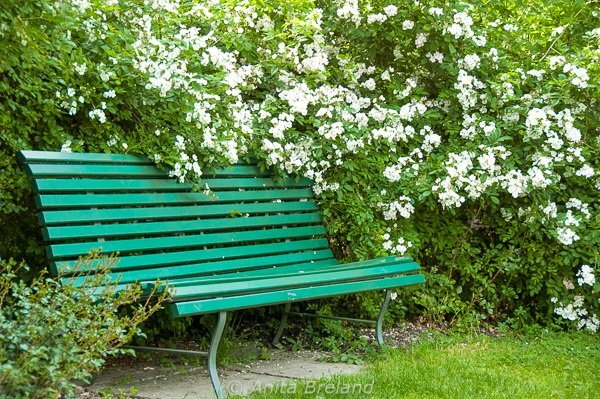 Its terrace is a great place for a break after meandering through the beautifully tended gardens. 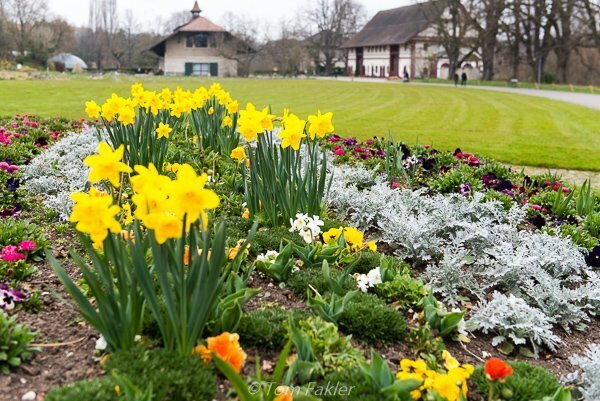 Merian Gardens is the first German Swiss member of the prestigious Association of Gardens of Switzerland. 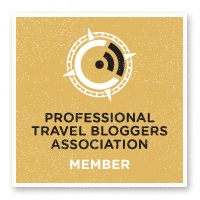 Others in the network are located in Canton Ticino: the Scherrer Morcote (Lugano), Parco di Villa Helleneum – Museum of Sculptures and the Parco Ciani Lugano, the Parco di San Grato Carona (Lugano), the Parco Botanico Isole Brissago (Locarno), the Parco delle Camelie Locarno and the Parco Museo Vincenzo Vela Ligornetto (Mendrisio). Member gardens in the network are characterized by a high level of care and have an educational mission as well. The network contributes to the dissemination of knowledge about the art history of gardens and botany through meetings, courses and publications. 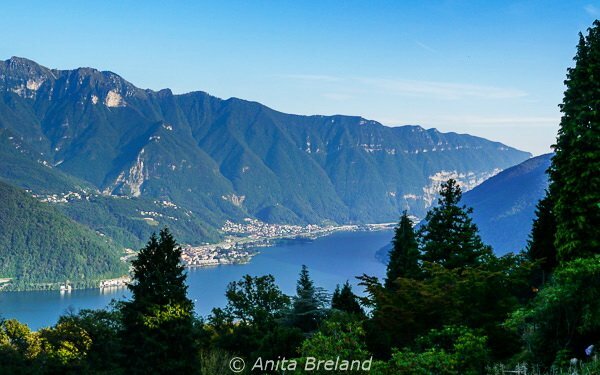 The Parco di San Grato Carona near Lugano offers captivating views of both Swiss and Italian Lago Maggiore. 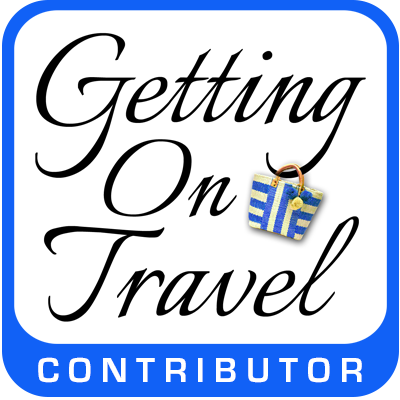 Next articleWhy is coffee in Portugal so good? I love visiting gardens when I travel and have added Merian Gärten to my to-do list for Basel. I hope those peonies are blooming when I get there, and that the sweet goat is still around with her bell (what is in her ears?). How I would love to visit during peony season. It must be a heady experience. 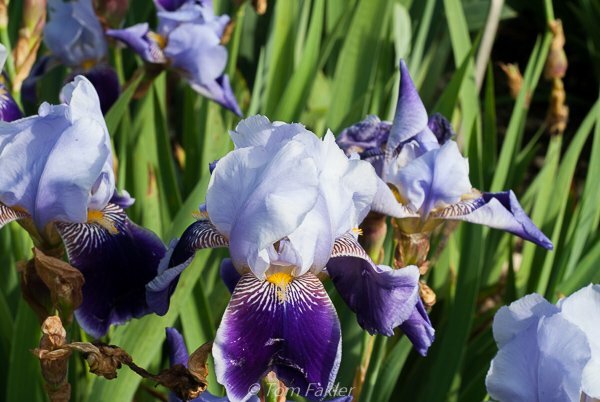 But then, I love irises, too, so I’d have to come back for the irises. And then there are the Mediterranean lavenders and thymes, so I’d have to come back…I see where this is going! Thanks for a lovely treat. I hear you…am a sucker for posies after the gray of winter! Luckily, the Merian Gardens is just one of the venues that makes Basel a great place to chase the back-story in the “three-countries” region, which makes it interesting for history lovers, as well. How lovely! We still have a couple months before our gardens are blooming in Calgary, but in the meantime your photos of the Merian Gardens are beautiful, and peonies are my favourite! Truth be told, we have about two months until peonies bloom here, so I guess our seasons are pretty much in sync! This post provides a refreshing jolt of color as we in the northeastern USA try to climb out of our winter dominated by the polar vortex (a gift from our Canadian friends). My husband and I have made visiting gardens one of our “go to” activities in new places we visit—-even though we gave up trying to have living plants in our home—out of a sense of mercy for the plants. We have the same relationship with houseplants–visiting gardens gives us an opportunity to enjoy the results of loving care administered by green-thumbed folk! I’m a gardener at heart and enjoy garden tours. I’d love to visit! I’m not a gardener, but admire the magic you create! And historic gardens are great for learning about the times in which they were created.